Instructions for how to cook bok choy are simple. It is important to note, however, that bok choy is rarely cooked alone. 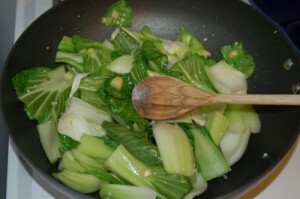 Bok choy is commonly used as a ‘filler’ food in stir-fry and other oriental dishes. Separate and wash the leaves. Trim off the tough base, and cut the white stem away from the green leaf. Chop the stems or slice them thin. Slice the leaves into strips. For every 4 cups of chopped bok choy, use 1/2 teaspoon of sesame oil. Heat the oil in a large skillet over medium-high heat. Add the stems and saute for two or three minutes, then add the leafy parts and cook about one minute longer. Add a pinch of brown or white sugar and a dash of soy sauce. Remove the pan from heat, cover it, and let the vegetables steam for approximately one more minute. Serve hot. Bok choy, a native of China, is rich in Vitamins A, C, and K. It harmonizes well with beef, pork, chicken, and shrimp or scallops.